A professionally designed and installed hardscape is an investment that will enhance your landscape and add value to your home or business. Our stone and paver work will create an outdoor living area and patio that will be a great place for your family to relax and enjoy the outdoors. We will discuss the project with you, listening to your needs and expectations of both our team and your new outdoor living area. Our stone designs will be tailored to fit your individual tastes and will blend naturally with the home’s exterior and existing landscape design. These craftsmen employ a huge amount of dedication, time, and expertise to carefully position each stone in place, creating low-maintenance stone additions to fit your landscape and taste. 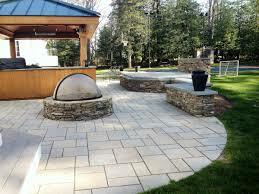 Hardscaping can take any landscape design to the next level. Whether you’re installing a functional retaining wall, or outdoor living space, our experts are capable of executing any type of hardscape installation. There are a myriad of design styles and materials used in hardscape designs, so it’s important to get the proper information before making a decision about hardscaping your property. We meet with our customers and do a thorough site survey to ensure we provide the most complete and accurate consultation. Very nice people. They did a great job installing my new fence. Quality work all around. They went beyond what was included in the price. I would recommend Romulo and his crew, and hire them again for any work I might need in the future.